Frances is part of Diana’s clique, she looks up to Diana and takes her word as gospel. She is a naïve young girl who has led a very reserved high school life. Unfortunately, she finds herself swept up into a grandiose plan that turns into a terrible incident. With her mother very much unaware of all that is going on, Frances must lean on her friends and her new teacher corper Yasmin to help her move on and deal with the consequences. Chinaza (also known as Ruby) Akubueze may be a teenager but she already has years of acting experience. She has starred in theatre productions, short films and web series including ‘Look Beyond’ and ‘Brother LIEnus’ (alongside AY Makun). Since her debut in 2013, she has also gained behind-the-scenes experience as a content developer for ‘Emergence,’ a youth online talk show. 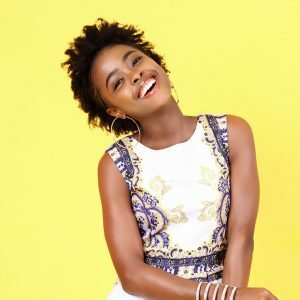 Ruby plays the role of Frances on MTV Shuga Naija.